72 • FOODSERVICE EQUIPMENT & SUPPLIES • NOVEMBER 2018 facility design p r o j e c t o f t h e m o n t h Customers dining at Prairie Mill and particularly those sitting at a counter with eight bar stools can see cookline production through a window. "We wanted to create a warm, quiet, calm place to dine while capturing the activity visible in the kitchen," Moller says. Within 45 minutes after placing their orders with a call center associate, patients receive their meals on trays that keep food hot using a plate and pellet system. Patients select meals from a six-page menu listing 45 menu items. Selections include build-your-own breakfast sandwiches, made-to-order eggs, baked goods, soups, deli sandwiches, entree salads and desserts. They also can select homemade macaroni and cheese, casseroles, and entrees such as stir-fry, country pot roast, soft shell tacos, -our-dusted sole and Swedish meatballs. "We design our menu to cross-utilize recipes at more than one location," Galloway says. "We're always designing menus that allow us to „nd a balance between producing really good food quickly. The cook-chill allows us to rotate menu items and keep the menu items fresh and varied." The kitchen contains a potwashing and dishwashing area. Prairie Mill restaurant and room service use china dishes, while Fresh Market uses compostable containers and other disposable serviceware. "Although this was not a LEED project, all efforts were made to be as ef„cient as possible and conserve energy and water," Moller says. The design team members agree that the success of the project, with its intense planning and daunting phasing, was largely due to the strong relationships among the team mem- bers. 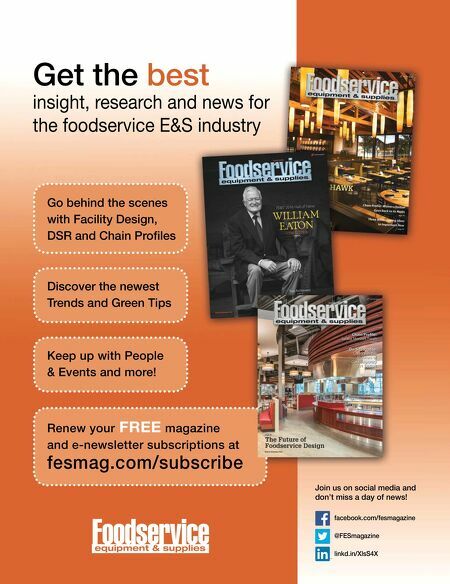 Under Gibson's direction, the design team advanced a contemporary healthcare foodservice paradigm by eliminat- ing the food court-style servery and replacing retail dining with a sit-down and a casual restaurant, and consolidating production for maximum ef„ciency. FE&S Lloyd (Rusty) Galloway, CEC, executive chef, Sanford Health System. Before joining the Sanford Health System team seven years ago, Galloway worked for Avalon Event Center in Fargo, N.D., and as a corporate chef for a restaurant group in Fargo. Lisa Gibson, senior director of Support Services, Sanford Health System. With a great passion for food, Gibson has worked mostly in the collegiate and healthcare foodservice segments and for a few years in a ne dining restaurant. For 14 years, she has led the foodservice department for Sanford Medical Center in Fargo. Prior to this she held several foodservice positions at North Dakota State University, Concordia College and North Dakota State College of Science. Danielle Kunkel, project manager, Ricca Design Studios, Greenwood Village, Colo. Kunkel joined Ricca Design Studios 11 years ago as an intern and was hired on full-time shortly after that. She has worked on a large variety of projects including hotels, universities, senior living centers and hospitals. Al Moller, LEED AP, principal, Ricca Design Studios, Greenwood Village, Colo. Bringing more than 33 years of experience in foodservice management, facility design and project management to each project, Moller's projects are found in hospitals, senior living facilities, hotels and universities in the U.S. and worldwide. Steve Stalboerger, architect and project manager, JLG Architects. Stalboerger joined JLG Architects four years ago. His many projects include Altru Health System in Grand Forks, N.D.; Sioux Falls Specialty Hospital, 85th & Minnesota Clinic in Sioux Falls, S.D. 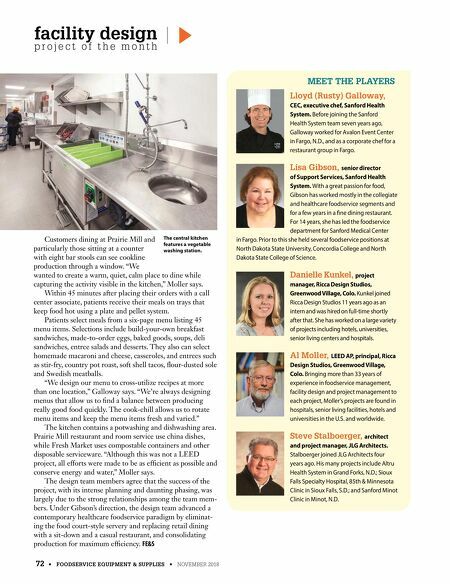 ; and Sanford Minot Clinic in Minot, N.D. MEET THE PLAYERS The central kitchen features a vegetable washing station.